Containers and Which Ones to Choose! How Do Grow Lights Work? HPS Grow Lights VS MH Grow Lights – Which Should You Use? LED vs HPS – Which Grow Lights are Better? What does N P K stand for? & How does fertilizer work? 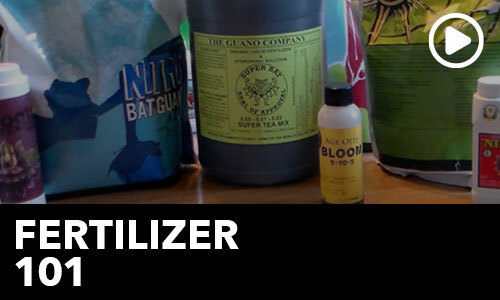 In this video, HTG Supply’s Dr. Myers showcases the various types of plant nutrients you can use on your indoor/outdoor garden(s). The Doc covers the meaning behind N-P-K (the three numbers written an all fertilizers). You’ll want a high Nitrogen fertilizer (N) number if you’re looking for vegetative growth; great for lettuce, spinach, and herbs. You’ll want a high Phosphorus fertilizer (P) number if you’re looking to substantiate your roots and/or bud and flower growth; great for fruit-bearing plants, or for root growth, especially in young plants. Potassium (K) is key to maintaining a healthy plant for the duration of its lifecycle and is incorporated into many base plant nutrients that also contain Nitrogen and Phosphorus.